I seem to be on a Stash Busting mission lately. While tidying up my Sparkles bin I found a bunch of these Top Coats Icings overlays. 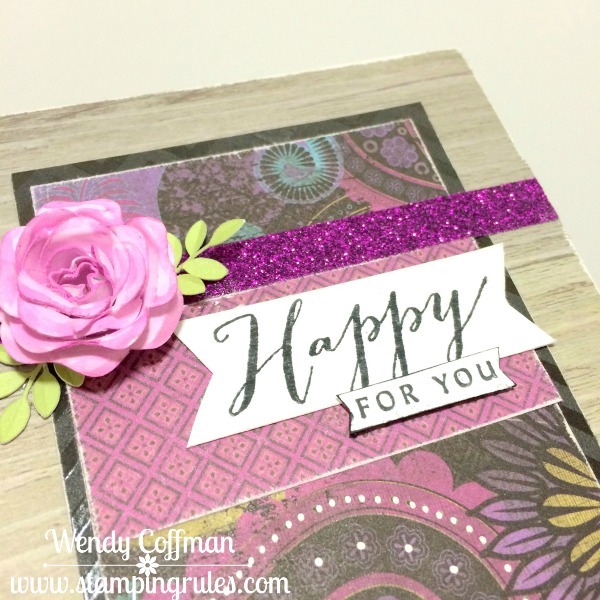 These were clear acrylic overlays printed in blues, purples, and silver foil embossing - so pretty! Rather than put them back in the box, I had to use a couple. 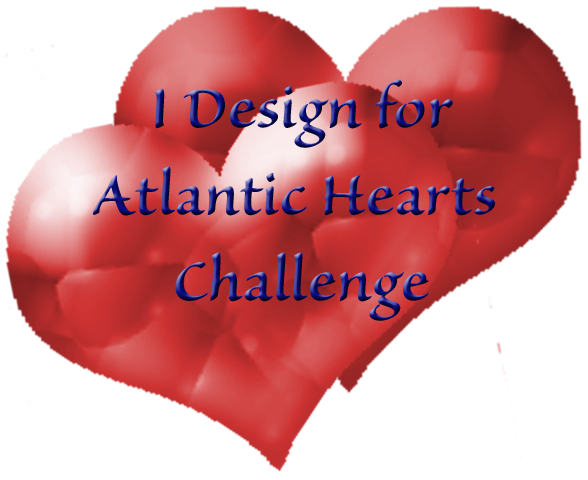 So I chose a few that fit this week's Atlantic Hearts Sketch Challenge. 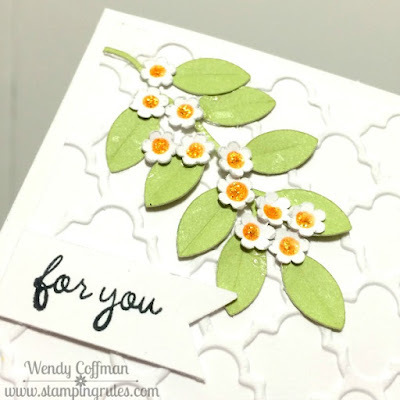 I embossed a panel of White Daisy Cardstock, then trimmed it apart and adhered the pieces to another White Daisy Cardstock panel. 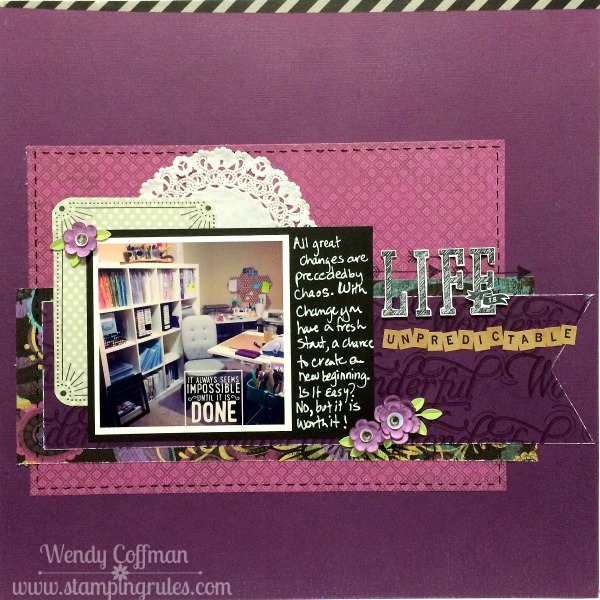 I added strips of washi tape and Purple Shimmer Trim. Then I adhered the clear overlays using Liquid Glass behind the designs. 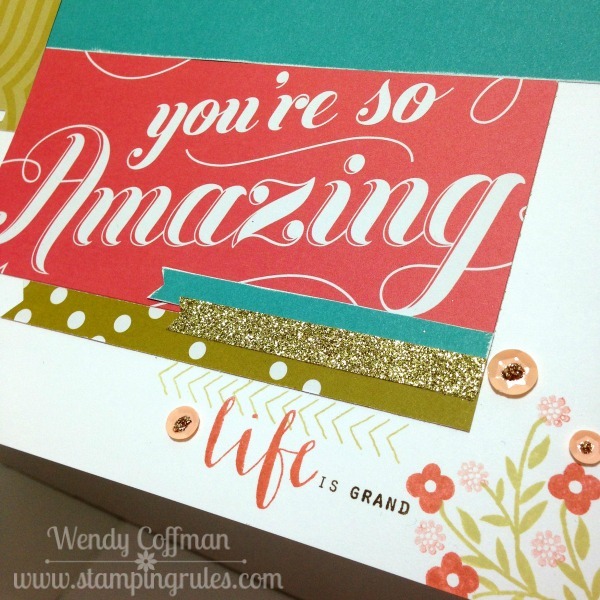 I applied Sparkles over the adhesive marks, and mounted the panel onto Timberline Woodgrain paper. 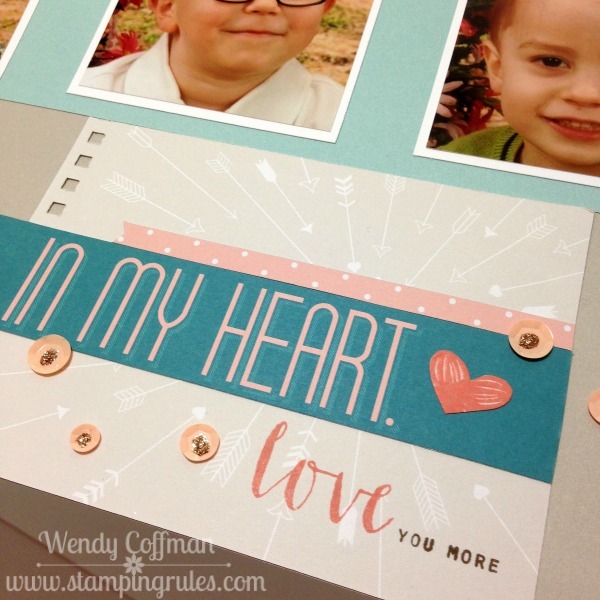 I'm linking up to the Heart 2 Heart Warm vs Cool Challenge. Hope you'll hop over to Atlantic Hearts and play along this week! So I've been working on these watercolor rolled Cricut cut flowers for a very special project, and posting the pics to my Instagram. 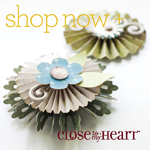 We have these flowers in different shapes on many of the CTMH cricut cartridges. This shape in particular is from the Art Philosophy cartridge, which remains my favorite cartridge to this day. It's my favorite flower on my go to, almost-always-has-what-I-need cartridge. There was one left over, which I used on this card, which lead to a question on Facebook about how to roll up these funky rolled flower shapes. Since rolling and shaping flowers is one of my favorite things, here's a little infographic tutorial for you! The first thing I do with a freshly cut rolled flower shape is add a dab of dry adhesive to the flat center of the shape. This could be Tombo, a glue dot, whatever you like that sticks well. Then I use my CTMH Quilling tool to roll them. I insert the smallest end into the wide slot on the tool. You could use tweezers, but I find this so much easier. Roll up the flower shape towards the center, wrapping it tightly around the tool. When you get it rolled as far as you can, Hold it tight for a few seconds to sort of "set" the curl. Let it go (Let it go!) and slide it off the tool. Place it on a flat surface and gently tap the center to help it relax into shape. Then press down lightly on that center to stick it to that adhesive we applied earlier. That's just to hold it in place until the next step. Apply Liquid Glass (or the sturdy liquid adhesive of your choice) down in between the petals of the flower. Let that dry completely before moving on to the last step. 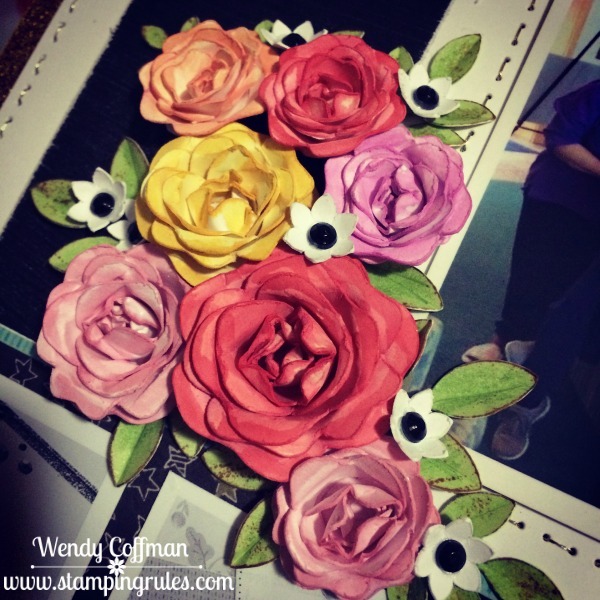 Use the quilling tool on the smaller side to roll the petals back. I like to start on the outsdie and work my way in. Sometimes I leave the center area untouched for a more rose like effect. 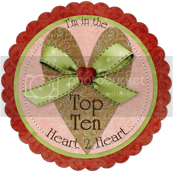 In the photo on the chevron above I used the tool to push in and down the center petals for more of a peony center. If I need it flatter I'll smack it down with a handy 3 x 3 or bigger acrylic block. Sometimes I fill the centers with Glitter. Take that basic flower and make it your own! 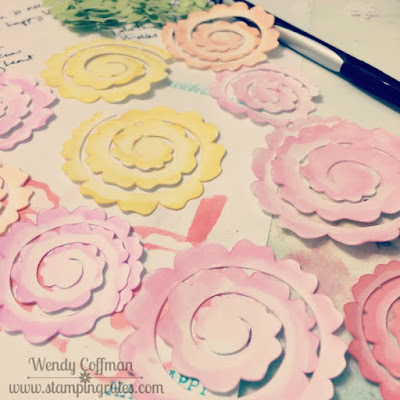 If you want to color on, emboss, sand/distress your flower, do that before you start step one. 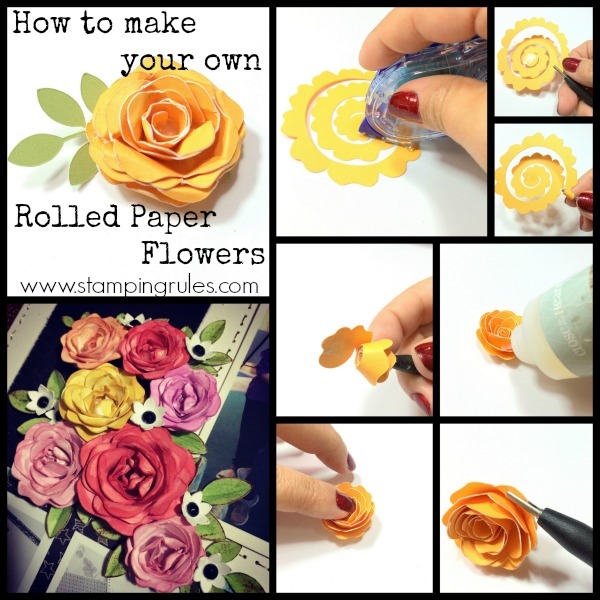 The possibilities with these rolled flowers are endless...endlessly fun! Oh. My. Gosh. I ran my Cricut machine for about ten hours today. Ten hours of iron on vinyl for CTMH Convention and Disney short projects. I can't see straight to weed anymore vinyl. It was such a relief when the new RetroSketches challenge dropped into my email inbox. I immediately threw down my weeding tools and started making this card. 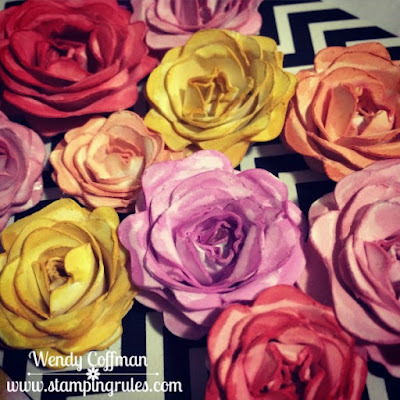 There was one small left out watercolored rose left from yesterday's project, which I haven't blogged but I did share a sneak on Instagram. These were a bit of work, with the Cricut cutting, watercoloring, rolling, distressing, shaping with my tweezers, then extra coloring and shading. So he was not going into the scrap bin to lounge around. Get to work, little flower! 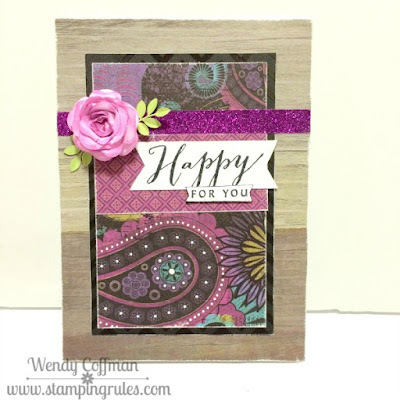 I paired my flower friend with some (retired) Laughing Lola papers layered onto some Basic Fundamentals chevron embossed paper and Timberline wood grain. Then I used my white gel pen to add some white details to the Lola printed design. Maybe I was just trying to avoid going back to my weeding, but I like the effect! I hope you like t-shirts...and Disney....'cause there's a lot of vinyl posts coming soon! I've had this large butterfly hanging out on my desk for a while now, ever since I made my butterfly CREATE wall piece. I didn't need him but I couldn't bring myself to recycle him, and now he's got a home. I based this card on the new Freshly Made Sketch and the ColourQ #296. 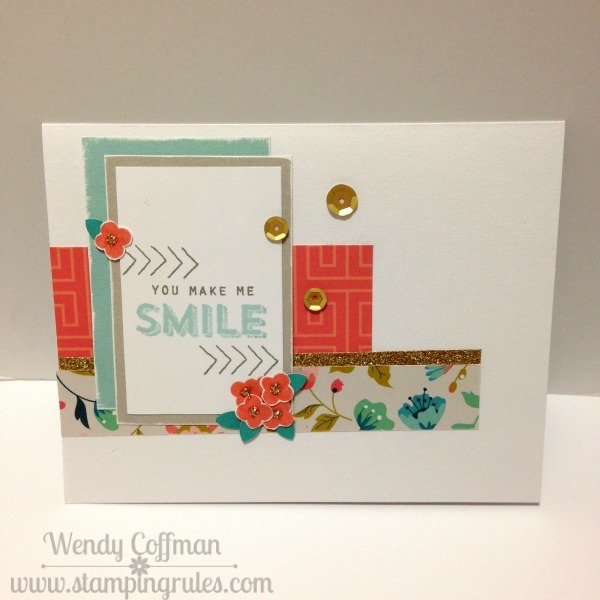 I used a bit of Blossom B&T backed with Canary cardstock. Then I added blue epoxy bubbles and bitty sparkles. 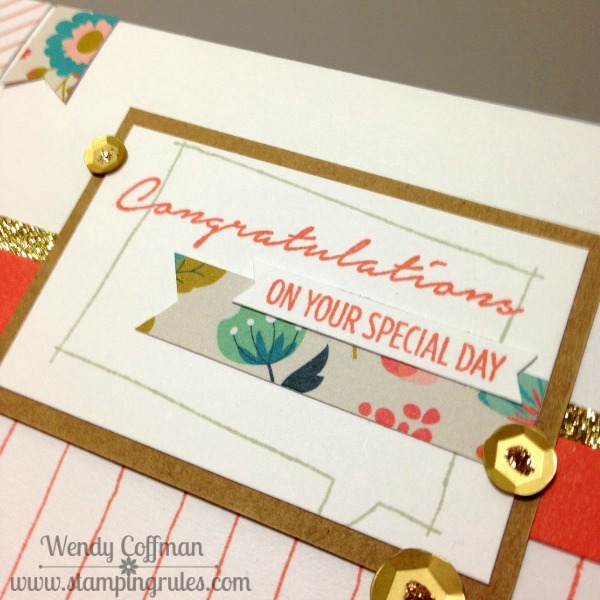 I kept the sentiment simple, stamping in Outdoor Denim ink onto Canary cardstock. Then I went over the words with a white gel pen to make them pop. I added gel pen touched to the butterfly wings too. 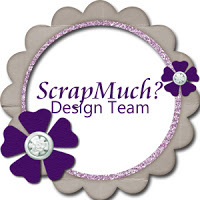 Tomorrow is the Scrapping Our Stash Hop - can't wait to share my project with you! 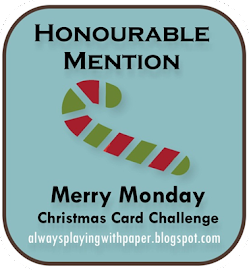 Tonight I got to whip out a card using my new Dizzy Circles set (Thank you, Naomi!). 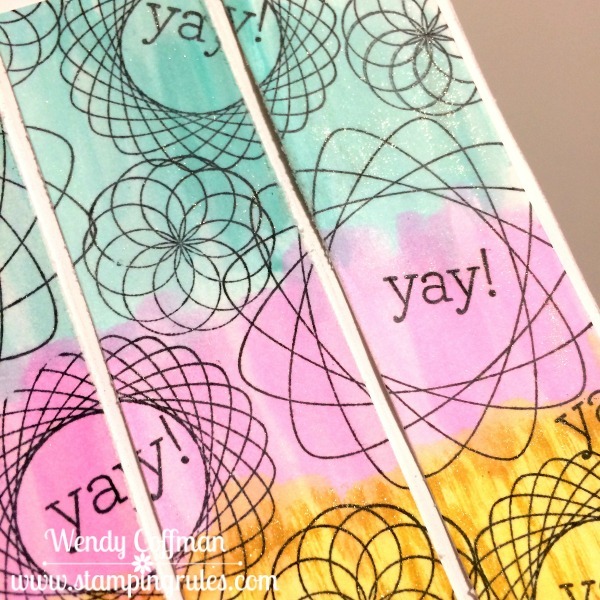 I stamped a panel of white cardstock with lots of circles and the YAY! sentiment in Memento Tuxedo Black ink. Then I used my water brush to add washes of color drawn from the Runway Inspired Challenge photo. Then I trimmed the stamped panel down into thirds as per the new CAS(E) This Sketch challenge. I added a strip of washi behind my stamped banner sentiment. I went over the panels with clear and gold Wink of Stella brushes. I couldn't get the sparkle to show in the photo, though the gold brush marks sure popped. I love Stella - it's so soft and sparkly! This is that last of the My Crush For Her cards I made this week. This is the other half of the front cover that I split for this layout. I used a white gel pen to add dots and details to the front cover. I didn't want to mess with that pretty floral spray much, so I just added some banners for the sentiment and a couple of sequins. 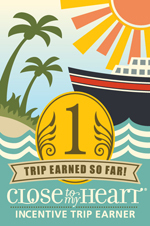 Only 14 days until I'm headed to California and I can start sharing my secret Convention projects. My Cricut has been working overtime lately! 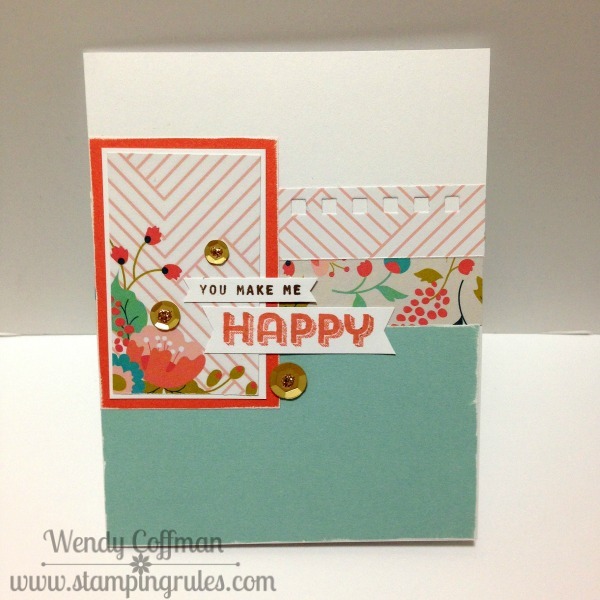 After today I have just one more card to share from what I made out of the My Crush for Her kit that CTMH gave us at the Seattle Making Connections Event. 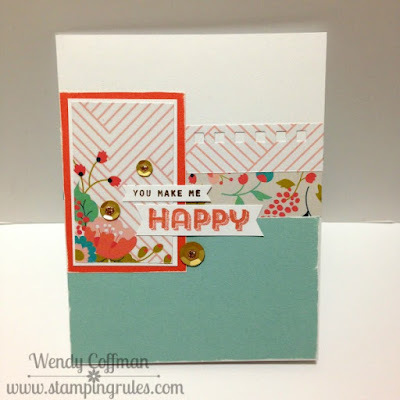 For this card I was really getting down to the scraps. 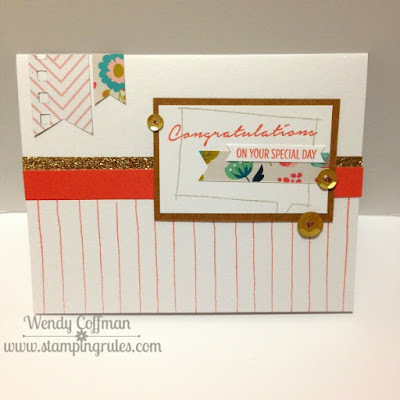 I stamped the lines onto the bottom half of the card using Smoothie ink, since I only had smaller strips of paper left to work with. 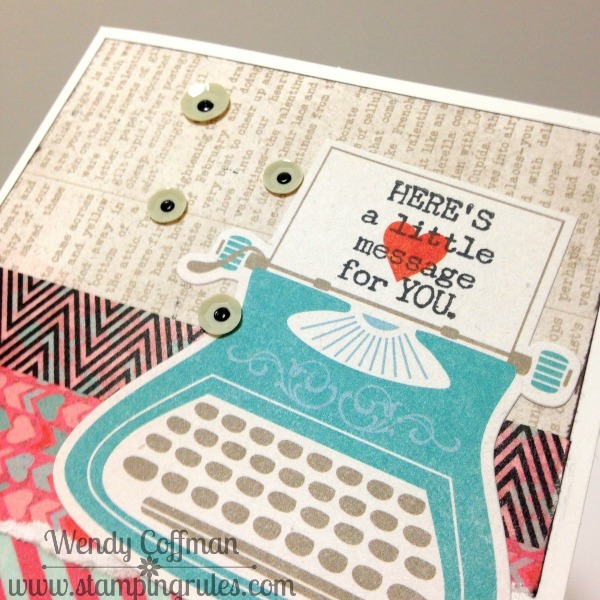 Then I added a word bubble to the main embellishment panel in Whisper Ink. 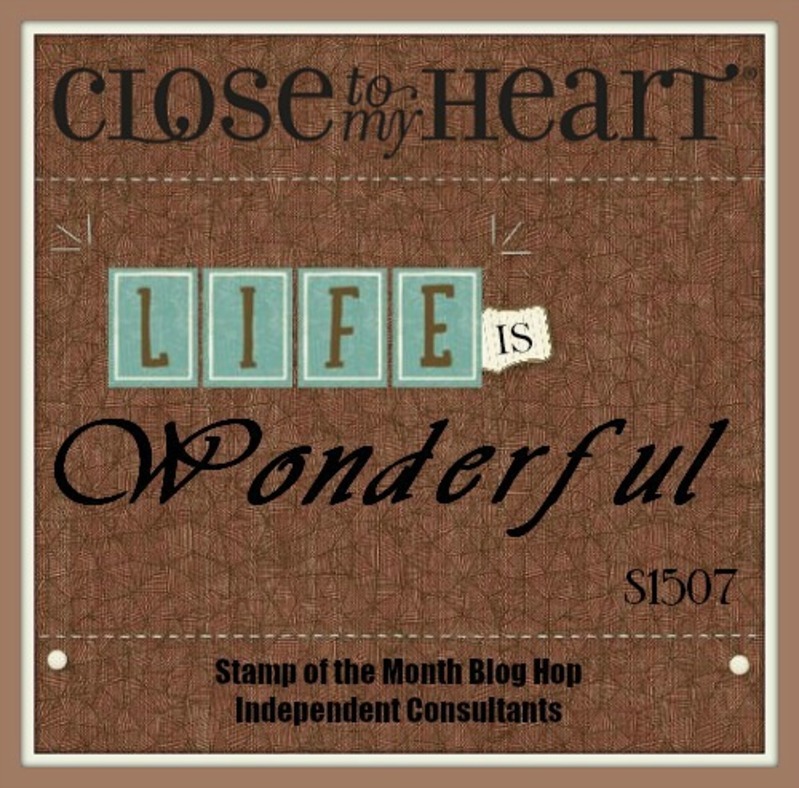 Both of those stamps came from the Documenting Moments stamp set. 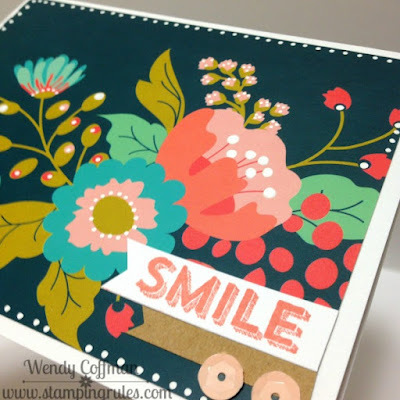 My sentiment came from the Shower Flower stamp set. 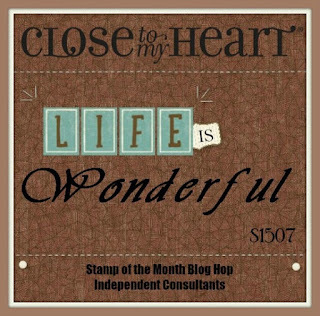 I love a nice narrow 1/4" sentiment - I think on the white banner it really pops. Hope y'all are having a fabulous Father's Day! 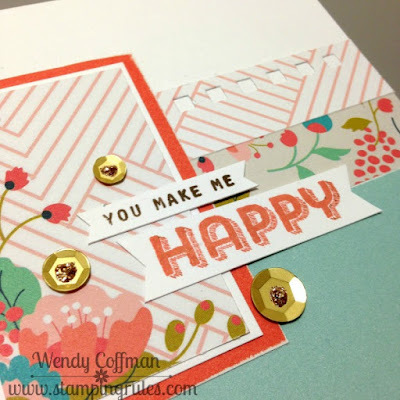 Using up all the scraps to make cards is one of my favorite things. 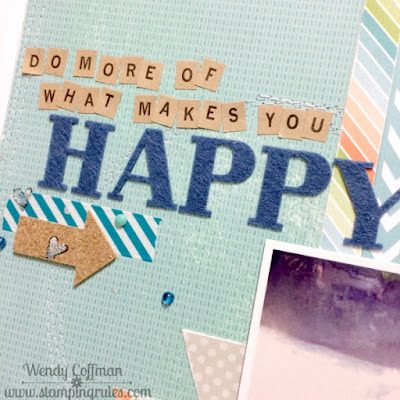 I hate to waste pretty paper almost as much as I hate storing a bunch of tiny scraps. This card was part of the kit CTMH gave us to make at the Seattle Making Connections. Except...I used some of the stuff on another unrelated project, so I had to improvise a bit. I love how the edge where I tore the page out of the My Crush for Her book adds a nice bit of punched detail to that element. I few sequins, some dabs of glitter gel, and this card makes me happy! 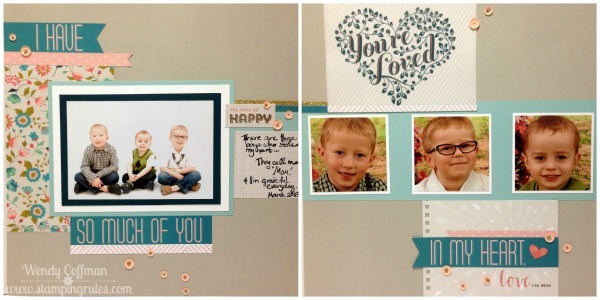 The second layout kit CTMH gave us in Seattle made this adorable layout. I love the look of the torn out pages we used for the background papers. I love how pretty the floral stamping turned out. The stamp set is Shower Flowers. 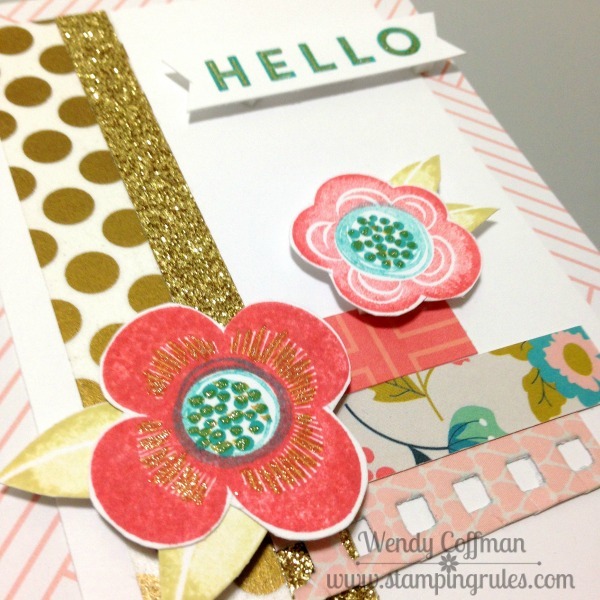 I got a little over excited when I was stamping the floral sprays, and I ended up accidentally adding some extra flower action to the page. No mistakes in paper crafts, just opportunities to embellish! This week I am sharing some more of the projects I've completed using the My Crush for Her books CTMH gave us at the Seattle Making Connection events. 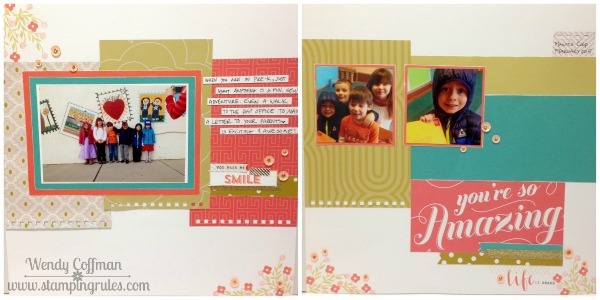 This is one of the layout kits that CTMH gave us to complete. The papers are all torn from the Crush book. The title is cut from one of the pages. I lost my instruction sheets, so I just (mostly) followed the picture and guessed what we were supposed to do. Nothing is wasted with these projects - event the covers are used. 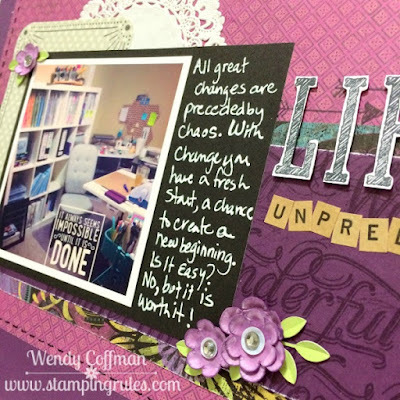 For this page I split the cover, since it was chipboard so I could use both sides. I wiggled my piercing tool into the middle of the cover and it split nicely right in half. Made it easier to cut it to size too! I'm linking this project up to the Heart 2 Heart Man Oh Man Challenge, since it's about these three boys whole stole my heart. I'm back with a card I pulled together as I was clearing off my desk. I had this big typewriter StickEase from the (retired) Heartstrings packet plus a few bits of paper leftover from those pages. I thought it wasn't really enough to make anything, but I couldn't toss it out. Then I saw this week's sketch at Retrosketches and it was perfect for my pretty scraps! I stamped a sentiment from the (retired) April SOTM onto the typewriter sticker using Memento Tuxedo Black. 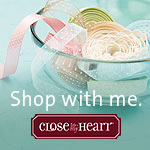 I used Smoothie stripe washi tape over Glacier cardstock to create my little banner. I filled my sequins with little dots of plain old Scribbles black puffy paint. Working with lots of retried items of late has made me ponder how close we are getting to retiring this year's Annual Inspirations Idea Book. A ton of awesome product is retiring very soon, and while that makes me a bit sad, it also makes me excited for convention with all the new stuff plus, you know, Disneyland. Check out what's on the chopping block here, before it's gone, gone, gone! I've been working my way through using up the rest of my My Crush for Her books. 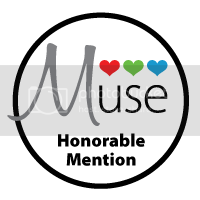 CTMH gave us two of these to work with at the Seattle Event in May. 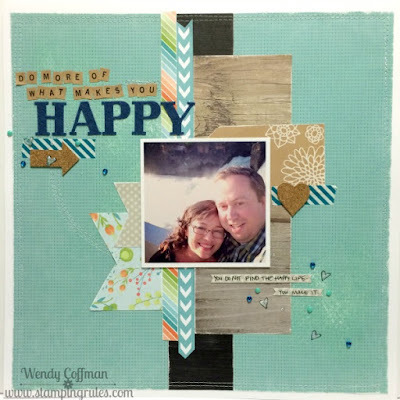 I started using mine up with this layout. 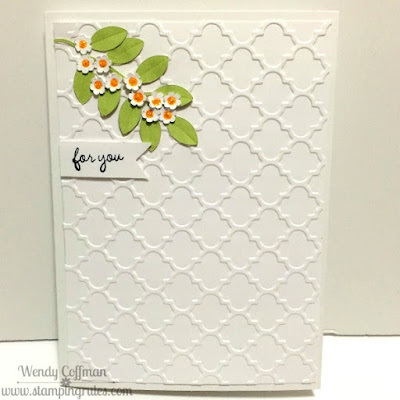 This weekend I finished the projects CTMH gave us to make with the books, with a few departures, and I made this card using the new Atlantic Hearts Sketch Challenge Sketch 112. I added Gold Dot washi tape and Gold Shimmer Trim to the card base. The patterned papers are all scraps from the My Crush book projects I'm sharing this week. 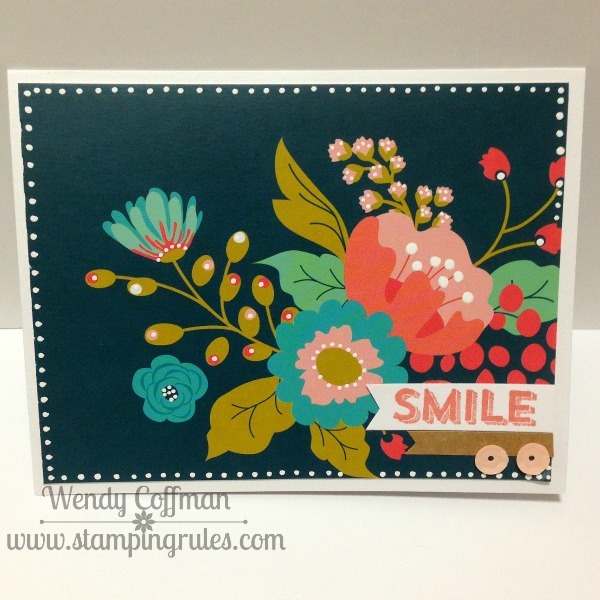 I stamped the flowers using Smoothie, Lagoon, and Flaxen inks. The stamp set is Shower Flowers. 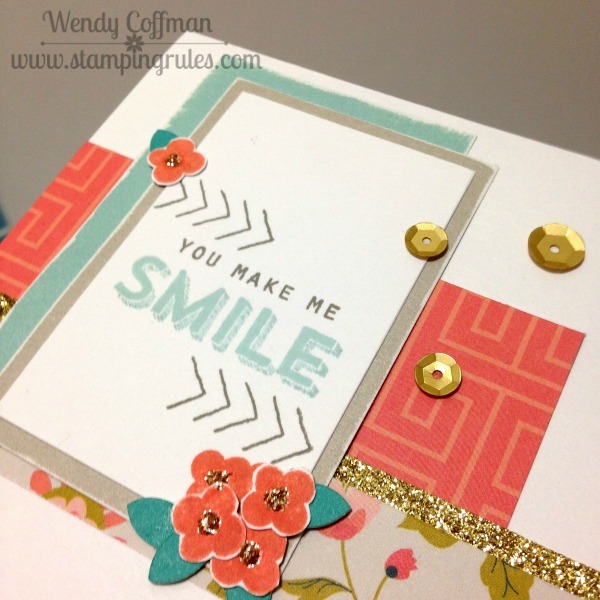 I added some Gold Wink of Stella to the flowers and inside the HELLO sentiment, which is part of my favorite sentiment stamp set in the Artfully Sent Cricut Bundle. Ah, it felt so good to get back into my glitter and foam tape! 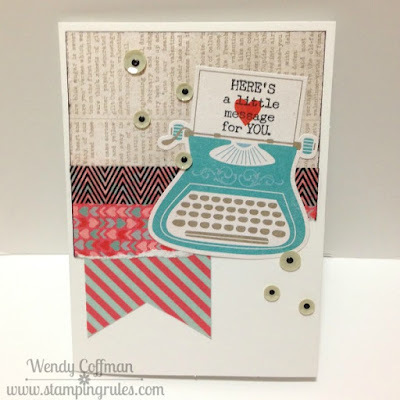 Pop over to Atlantic Hearts to play along with this sweet sketch!